Using powerful ground-penetrating radar, investigators working around Stonehenge have detected a trove of previously unknown burial mounds, chapels, shrines, pits — and most remarkable of all — a massive megalithic monument made up of more than 50 giant stones buried along a 1,082-foot-long c-shaped enclosure. This news is unreal — and it's resetting virtually everything we thought we knew about Stonehenge. Just a week after finding out that Stonehenge was once a complete circle, archaeologists from Birmingham and Bradford universities, and from the Ludwig Boltzman Institute in Vienna, have shattered the image of Stonehenge as a desolate and lonely place. 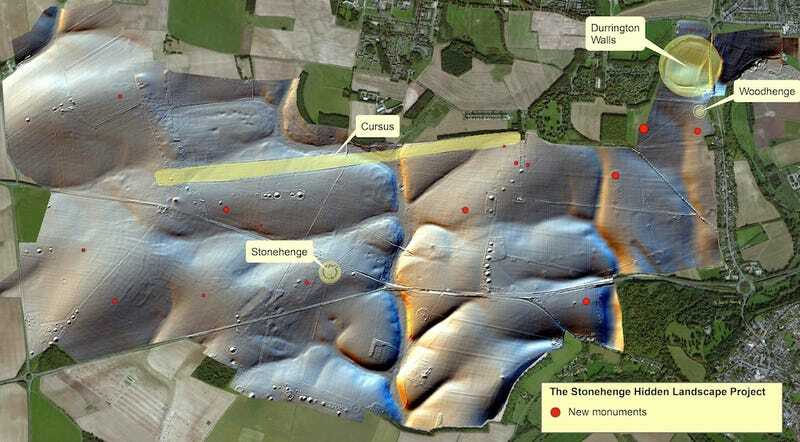 After four years of painstaking effort, and by using a magnetometer, a ground-penetrating radar (GPR), and a 3D laser scanner, archaeologists have shown that Stonehenge was once a sprawling complex that extended for miles. And then there's the previously unknown "super henge," a monument located just two miles from Stonehenge. Scans suggest that each buried stone is about three meters (10 feet) long and 1.5 meters (5 feet) wide. The stones are positioned horizontally, not vertically, but it's conceivable that they originally stood upright like other standing stones. The archaeologists suspect they were brought to the site shortly before 2,500 BC. The c-shaped enclosure – more than 330 metres wide and over 400 metres long – faced directly towards the River Avon. The monument was later converted from a c-shaped to a roughly circular enclosure, now known as Durrington Walls – Britain's largest pre-historic henge, roughly 12 times the size of Stonehenge itself. As a religious complex, it would almost certainly have had a deeply spiritual and ritual connection with the river. But precisely why is a complete mystery, although it is possible that that particular stretch of water was regarded as a deity. As for the other henge-like Neolithic and Bronze Age religious shrines, they range between 10 and 30 meters ( 32 to 100 feet) in diameter. Scans also revealed around 20 large ritual pits, each up to five meters (16 feet) in diameter. More than a half dozen Bronze Age burial mounds were discovered, along with four Iron Age shrines or tombs, and a half dozen Bronze Age and Iron Age domestic or livestock enclosures. Under one of the mounds, the investigators identified a 33 meter (108 feet)-long timber building dated at about 6,000 years old. It was likely used for ritual burials and related practices. "[The building] has three rows of roof-bearing posts. It is around 300 square metres and slightly trapezoidal, which is interesting because in the same period on the continent, about 100 to 200 years earlier, we also find this type of trapezoidal building related to megaliths [giant stones]," noted Wolfgang Neubauer of the Ludwig Boltzmann Institute in a BBC article. The monuments and structures were not all built at the same time, so the entire complex was not conceived or planned as a whole. Further analysis will reveal exactly how the site evolved through the ages. A two-part BBC Two documentary titled "Operation Stonehenge: What Lies Beneath" will be shown this coming Thursday evening and next Thursday. Many more details of the investigation's new discoveries are expected to be revealed.